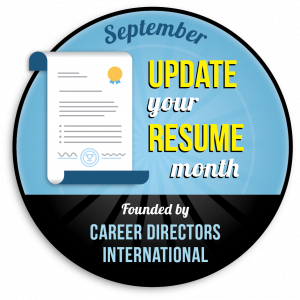 September is the perfect time to start a new approach to career care-taking. While children are embarking on starting the new school year, adults should also be taking stock of their professional attributes and career value by updating their resumes. What we think of as a ‘life print,’ or guideline for career development, will provide a proactive approach toward meeting unforeseen market and company changes, in reevaluating personal worth and in preparing to obtain the next step in career growth. Too often job seekers avoid taking this crucial step until the last minute, when they need their resume yesterday. However, by declaring September as the official update month, people will have the opportunity to better control and champion their own futures.